How to change the order of tests inside a test suite quickly? - Kantu - Forum for Kantu Task and Test Automation and the free OCR API. The test suite feature is great, I love that I can reuse macros like “logon”, “logoff” etc in many test suites. But how to change the order of tests inside a test suite quickly? The ability to drag and drop them around would be great. In Kantu, test suites are simple and clean JSON files that you can edit. 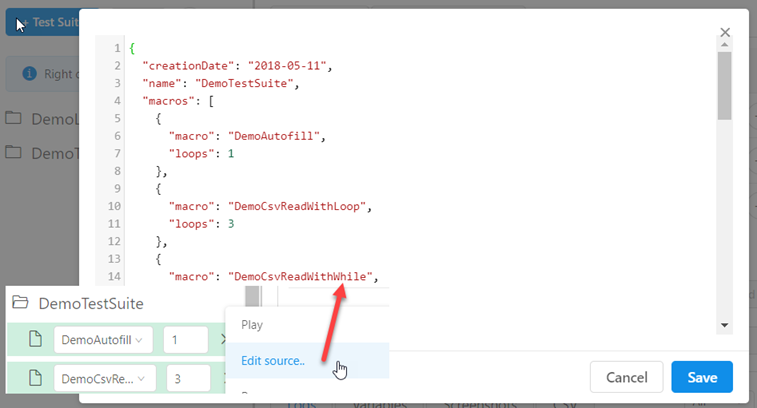 For larger changes in the test suites, editing the JSON source code is the fastest option. How to change the order of tests inside a test suite?